It seems like my instagram feed is blowing up with people in Paris right now, so it inspired me to go back and finally finish editing my photos from our trip back in May. I’m thinking about doing a little guide to planning a trip to Paris – would you guys be interested in that? Anyway, this little gem of a bodysuit was a lucky find right before we left and I’ve been wearing it nonstop this summer. Looks good with pretty much all high-waisted denim and easy to dress up for a dinner date. I wore this for dinner in Paris fresh off a shopping trip to the Frankie Shop, where I found this cute clear bag. This shop has a very cool, eclectic mix of unusual brands and it was hard not to bring home a boatload of stuff. For dinner, we decided to do a sort of “restaurant hop” instead of getting reservations. We started with a delicious array of snacks at L’Avant Comptoir de la Mer, a low-key spot that came highly recommended by multiple sources. Their crab deviled eggs were incredible, as were their langoustines. Afterward, we made our way to Fish La Boissonnerie, one of our favorites from the last time we were in Paris. The restaurant was crowded but it was easy to get a seat at the bar. The wines are always fantastic here and the bartender was happy to offer us some great recommendations. We shared an amazing tagliatelle dish with morels and asparagus and some totally addictive caramelized bread pudding-like thing for dessert. For post-dinner drinks, we headed to Maison Sauvage, a restaurant and bar covered in flowering vines with an equally cool interior. It’s perfectly situated for Saint-Germain-des-Prés nightlife people-watching so definitely grab a seat outside if you go. 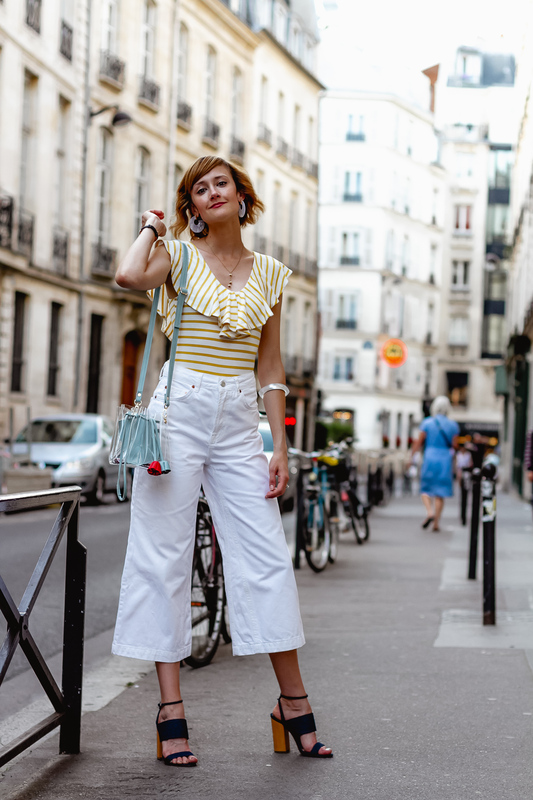 Writing this post is making me super nostalgic for Paris right now, so pardon me while I pour myself a glass of wine to drown my sorrows! I love the ruffle neckline on this bodysuit!! I love the ruffle neckline on this bodysuit!! This entire look is great! That body suit is such a steal! I saw a similar one at Nordstrom that I’ve been eyeing. Happy Friday babe! That bodysuit is so fun, I love the ruffled detail at the top! And the shoes, always love seeing those! Love the bodysuit! And I would definitely love to read about more of your Paris recommendations. Ohhh my, this look is so stylish. I love it! Super chic and gorgeous on you dear! Love the white jeans too. You wear this very well ! Wonderful photos my dear! Beautiful outfit!